During the 1930s two new political parties arose in the west. The prairie provinces were perhaps the hardest hit by the depression. 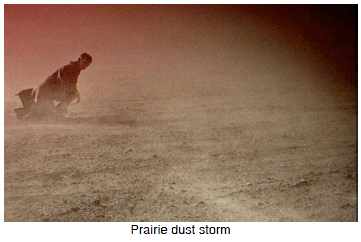 As well as poor markets for wheat, Alberta and Saskatchewan had to endure drought and dust storms that turned many farms into sand dunes. Desperate farmers began to join movements for reform. 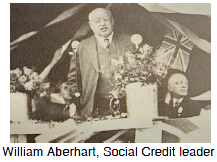 The Social Credit party was led by William "Bible Bill" Aberhart, who was already known to Albertans through his weekly religious radio programmes. The Social Credit financial policies, which denounced the traditional banks and promised to pay dividends of $25/month to Albertans to boost the economy, appealed to farmers who were heavily in debt. The party won a large majority in the 1935 election in Alberta, but never became a federal party and did not have much success in any other province except British Columbia. 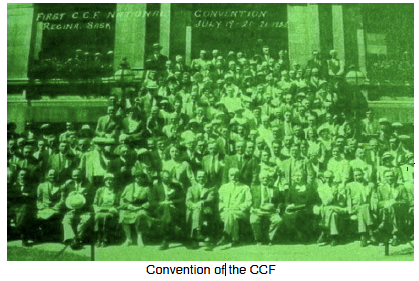 The Cooperative Commonwealth Federation (CCF) was a more left-wing party which united farmers, labourers and socialists, though its support among these groups was not unanimous. J.S. Woodsworth has been called a saint in politics because of his real devotion to the cause of improving the human condition. The CCF was forced to moderate its views on government ownership of land in order to achieve more popular support, but the party has lasted and under its current name, the New Democratic Party, it has provided a third party alternative at both the provincial and federal levels. In the 2011 federal election the NDP won the most seats in its history and achieved Official Opposition status.